It’s time for another free tutorial! 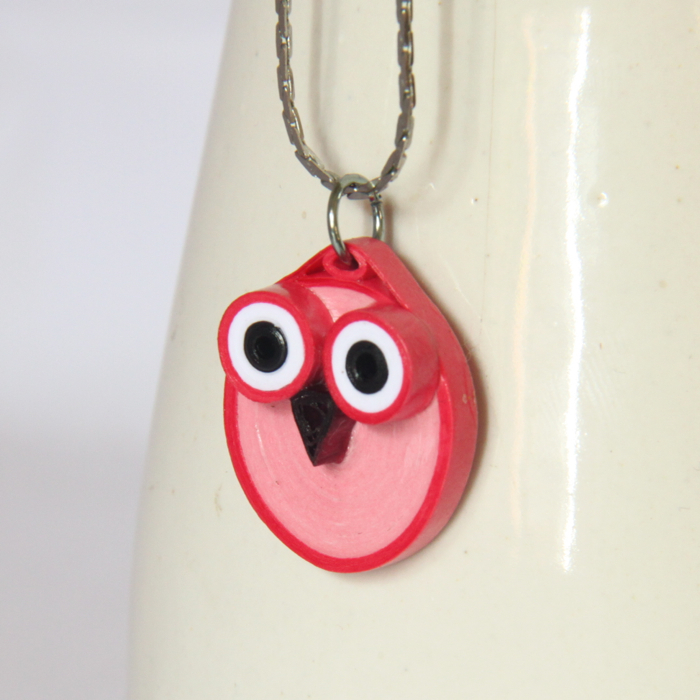 I have many planned for this year, so I’ll start with this adorable simple owl pendant. It can also be used as earrings, a magnet, to adorn a greeting card, or anything else you can think of! 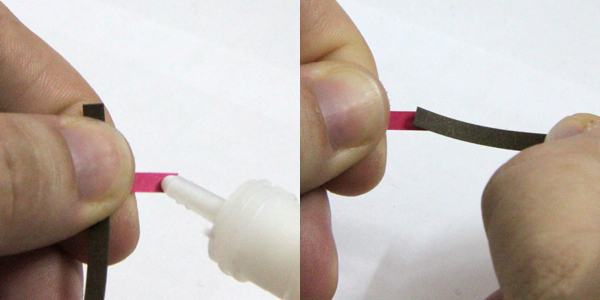 For each body, glue together one spring green and one aqua strip. Rip off 1 ½” length from the end of the aqua color. Roll this into a tight roll with an empty middle. Roll the strip starting with the spring green end. When you have about 6” of the aqua end left, glue the tight roll on and continue wrapping the last 5” of length around your body shape. Glue into place. Pinch the two sides carefully so that your finished tight circle body is more of an oval shape, with the added tight roll at the top to put in the jump ring to make it into earrings. This photo shows how to make a large solid roll for the body. The small solid roll for the little ring at the top is made in the same way, it’s just a lot smaller! You can use your needle tool to make sure the inside of the small solid roll has an empty middle, just push aside the little flap that is created when you use the slotted tool. This s hows how to add in the small tight roll so that it is wrapped up in the main body. This allows your finished design to be sturdy. You can also just glue it on top instead of wrapping it inside if you wish. 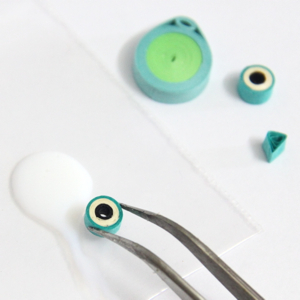 To assemble, pour a little glue onto a surface and dip your eyes and nose pieces into the glue. I like to use tweezers for this as the pieces are quite small. Place the eyes and nose onto the base, and adjust as necessary. These can, of course, be made in any color combination you choose! Make them realistic colors, or make them colorful and fun as I have done here. Use longer strips of paper to make bigger ones, and shorter strips of paper to make smaller ones. These are approximately 3/4″ (2cm) wide (at the widest point in the body) and 1″ (2.5cm) tall not including the jump ring. Or if you’d like to purchase this or other owl jewelry that I have made, or make a custom order for some (I can make them in any color combinations! ), visit my etsy shop! 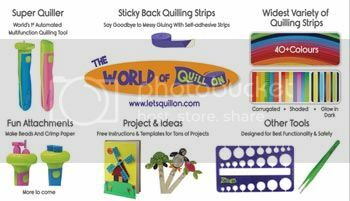 Click here to view paper quilling tips and tricks, sorted by subject! 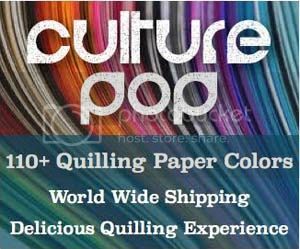 Click here to find where you can buy quilling supplies, sorted by country! *This post contains some affiliate links. If you purchase products through these links I get a small percentage (at no cost to you!). I only link to products that I believe in and/or love to use myself. Thank you for supporting my blog! I like very much quilling patterns, I would like to learn this method.